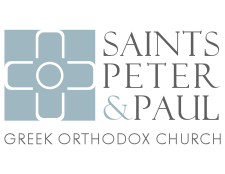 This past Sunday, our 4th grade Church School students each received an Orthodox Study Bible at the close of liturgy. We pray their lives, like their church school curriculum will be centered around Christ and his word. Faith, Love & Joy had its first meeting on Friday. The kids rotated between gym time, crafts and Orthodox Life. The focus of the day was the Cross and how we can look to the cross when we are scared or sad to bring us comfort and peace. Also, we played some dodgeball. Our Junior and Senior GOYAn’s spent their Wednesday at the church spreading mulch, picking up trash, building a fire pit and cleaning up storage rooms. It may have been a day off of school, but it certainly wasn’t a day off from hard work! Our Sr. GOYA Secretary, Andrew Pappas, commented that our efforts were done just as Christ calls us all to act. “In the same way, let your light shine for others, that they may see your good deeds and glorify your father in Heaven,” Matt. 5:16. Now are parish, “this House of God” shines even brighter upon the community of Glenview. Awesome job to everybody involved, and a big thank you to Brad Desent and Tom Anton for organizing and providing us what we needed to be successful. Glory to God for such an awesome day.